My photographic artworks rely on beauty and the art of seeing. They are a reflection of my ongoing personal search for meaning and understanding. Photography and art-making are my means of exploring, questioning and reinterpreting the way that we perceive our world. 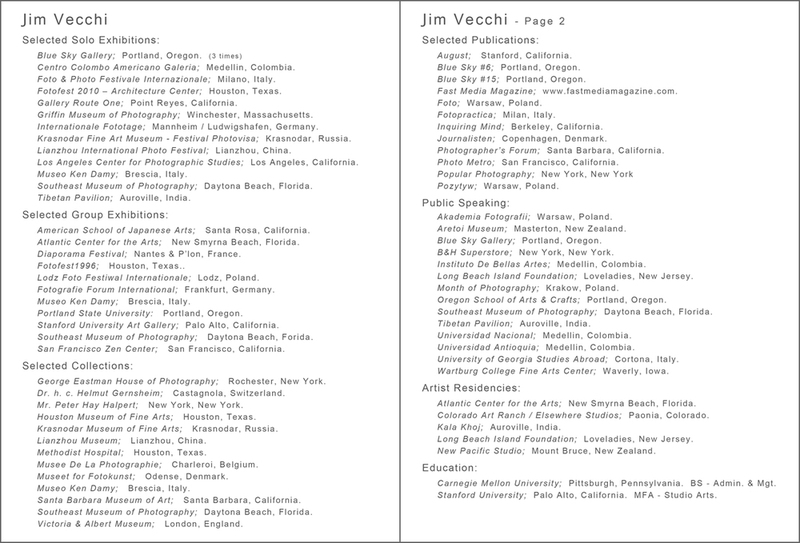 My photographs have been internationally exhibited and published, and are in the collections of such fine institutions as the Victorian and Albert Museum in London, the Houston Museum of Fine Arts, the George Eastman House, the Santa Barbara Museum, the Musee de Photographie in Charleroi, Belgium and the Lianzhou Museum in Lianzhou, China. I have an MFA from Stanford University and have taught courses and workshops on various aspects of photography in both the United States and Europe. I am a dual U.S. / Italian citizen who is currently living between Pittsburgh, Pennsylvania where I was born and raised and the San Francisco Bay Area. Click on my CV below to enlarge it.